One of our more interesting manikins that can be used to simulate impalements or amputations to bring added interest to any training exercise. 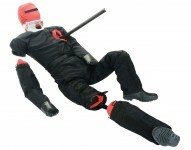 Made from the same tough Polyester as the Duty range, these manikins are tough enough to be used in Confined Spaces, USAR incidents, Chemical/Biological Hazard, Road Traffic Collision (RTC) & general handling exercises. The removable limbs can also be partially attached using the Velcro at the end of the limb to partially attach the limb - in this way the limb may fall off during recovery if a thorough injury assessment is not made by the rescuer! Anatomically correct weight distribution gives the 'feel' of an unconscious person. A Polypropylene, plastic sleeve allows the introduction of an impalement - scaffold poles, concrete reinforcing bars and fence posts can all be used for this purpose. The right arm and leg can be completely or partially detached to provide real interest to your training exercises. Strong enough to be buried under concrete or steel lintels with no damage (care should be taken with the plastic sleeve) - these manikins are tough! The Polyester is waterproof, making it suitable for wet or foul scenarios such as Hazmat/ CBRN as it can be more easily cleaned and dried than canvas models. 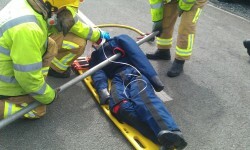 Tough drag protectors and overalls to greatly extend the life of your manikin. Shoutbox and hood to give your casualty the power of speech to add extra realism. Face mask and wig for a more human-like appearance. Constructed in the same flame retardant Polyester (conforms to BS EN ISO 15025:2002, OEKO-TEX® Standard 100 and ISO 17050-1) used in Police ballistic/stab vests. Protective overalls fitted as standard - constructed in the same flame retardant Polyester (conforms to BS EN ISO 15025:2002).